1. Bring ½ cup of quinoa, ½ cup water, 1 cup almond milk, and dash of sea salt to boil in a small pot. 2. Once boiling, reduce the heat to a simmer and cook, stirring occasionally until all the liquid has been absorbed (about 10 minutes). 3. Remove quinoa from stove and transfer to a bowl. 4. Mix in the mashed banana, cocoa powder, vanilla, and honey. Stir until combined. 5. 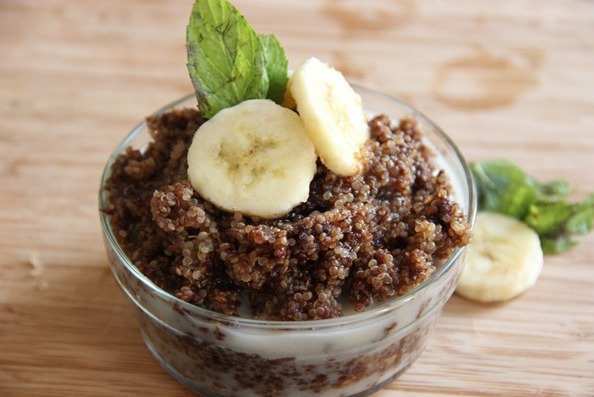 Pour the remaining ¼ cup of almond milk over quinoa, garnish with banana slices and mint (if desired), and enjoy!